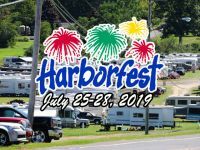 Tyler Thompson competed in his first International Classic Weekend as a Supermodified driver over Labor Day Weekend at Oswego Speedway, and few will soon forget it. 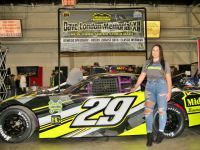 The 16-year old up and comer competed in three straight days of action at the Steel Palace, leaving a lasting impression on those who took part in the weekend. On Friday evening, Thompson wheeled his No. 98 Hawk Chassis Novelis Supermodified to the 17th starting position for the 35-car Budweiser International Classic 200 with a lap of 16.559-seconds at 135.878mph. While this run was very impressive, the overnight engine rebuild that took place by Jason Simmons Racing and Morrison Performance, was masterful. 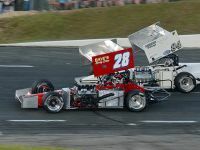 During Friday evening Classic time trials, Sprint Car veteran Joe Trenca was tabbed to compete in the back-up JSR Supermodified, typically used by the team in winged ISMA competition. Engine issues plagued the team all night, resulting in an overhaul needing to be completed in order to have the car ready for Thompson in Saturday night’s ISMA Super Nationals. Staying up through the night, JSR and Morrison Performance worked to rebuild the top end of the engine for use on Saturday evening, with the team barely making it to the track in time for ISMA qualifying. After finishing fifth in his heat race, Thompson started the 60-lap ISMA Super Nationals from the second position, outside four-time Nationals champion Tim Jedrzejek, and proceeded to take the lead in dramatic fashion. With the crowd on its feet, Thompson wheeled to a full straightaway lead on the field within a handful of laps and appeared to be well on his way to an unprecedented Classic Weekend win. Unfortunately, the fairy tale run would end too soon, as on lap-20 the bottom end of Thompson’s engine let go, bringing the No. 98 to a flaming stop in turn two. Despite not finishing the event, and leaving with a blown engine, Thompson and team were the story of the Speedway for the remainder of the weekend. On Sunday morning, Thompson’s stretch of tough luck continued, as the No. 98 found Oswego’s outside wall in early morning Classic practice. Yet again however, the JSR team stood tall in the face of adversity, replacing front and rear suspension components on the machine in time for one final warmup prior to the International Classic. Once in the 200-lap International Classic, Thompson drove the race with the poise of a 16-year veteran, not a 16-year old rookie. After starting 17th, Thompson was comfortably in the Top 15 before long, and past the 100-lap halfway point was contending for a Top 10 position. Nearly 150-laps into the race, Thompson was now riding 10th ahead of defending champion Dave Shullick Jr., until contact between two cars in front of him resulted in Thompson taking a trip into the first turn foam on lap 145, knocking him out of the event with a 17th place finish. Despite not finishing either Supermodified event over the weekend, the fans in the stands and the teams in the pit area were made well aware that Tyler Thompson will be a threat in the Supermodified ranks for many years to come. 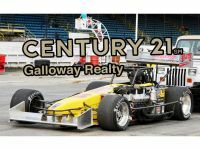 While Thompson’s Supermodified season at Oswego Speedway has ended, he will still be in action on the dirt for the remainder of the fall. Thompson returns to DIRTcar Sportsman action this weekend at Can-Am Speedway on Friday night and at Thunder Mountain Speedway on Sunday. Keep up with Thompson and Jason Simmons Racing through their all-new website at www.tylerthompson98.com.